Part of the squash and cucumber family but unloved by many including my mother who instead of appreciating new life and food in her garden in Ireland, complains about the glut of courgettes she has to deal with every year. So why does she grow them? Why doesn't she feed her neighbours with them? The answer is simple - many people dislike the bloody vegetable, grow them because its simple and never know what to do with them. Obviously courgettes do not inspire! Courgette is french but Zucchini is italian and just the name seems more poetic. In order to encourage me in my courgette/zucchini growing, I think colour! I want the whole range: white, yellow and green and a plant or two of pale green or golden patty pans. This year its Egyptian White, Constata Romanesco and Gold Rush and I think italian in the kitchen as their recipes seem to be the only ones that I find alluring. Romanesco is a bright green ridged variety which are crisp and have a strong flavour. The Whites are tender skinned and creamy flavoured with small almost invisible seeds and are perfect when raw. ... while patty pans have to be only eaten as babies - thinly sliced and raw. In my garden they are right in front, soaking up the heat of the sun which is the main ingredient for producing flowers and therefore fruit. A courgette grown in the shade will be glossy and green but the fruit will be few and far between. Fed lots of compost at the beginning when transferred from the greenhouse to their patch, they still need a weekly dose of nettle tea and lots of straw to keep the soil moist. 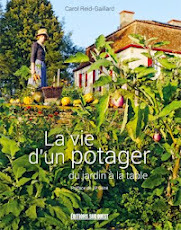 At the beginning, the young plants are a delicacy for snails and slugs but if you can protect them in their first week with wood ash, they will survive. My rather large mistake this year was to underestimate their growing potential. A courgette doesn't like to share his bed with a cucumber so keep them well apart. I thought I had done so when installing my teepee to help my Kiwano cucumber climb but the courgette plants have grown so huge, they are also touching the teepee and putting my Kiwano harvest in jeopardy. 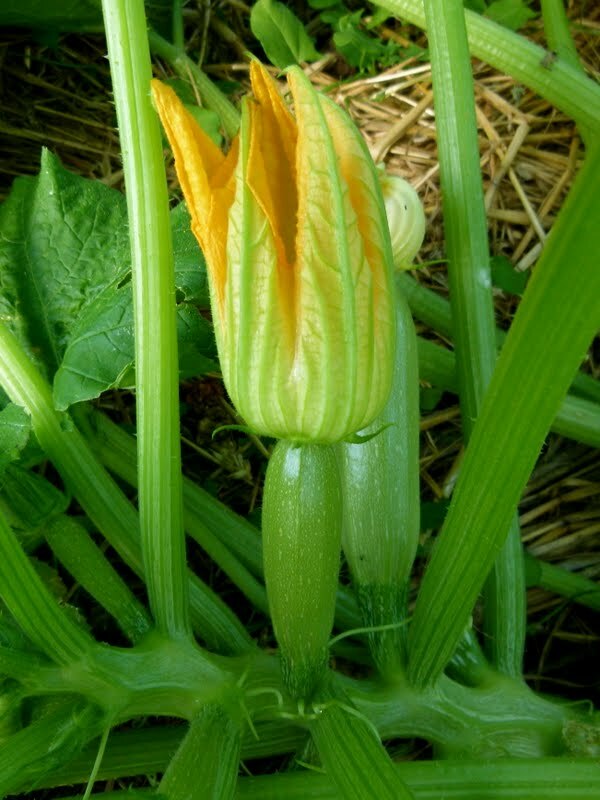 Courgettes need to be eaten very young when their skin is glossy and the flowers are still holding on. In Italy they sell them with the flowers still attached to prove their youth. The nutty flavour and crispy flesh disappear very quickly so they need to be found fresh and eaten the same day. If a courgette is bigger than a 10cm just forget about the centre and eat the flesh nearer the skin where all the taste is concentrated. Health wise a courgette is far down on the super-food scale, unlike their winter cousins of squash which are packed with natural beta-carotene. They start tasting perfect when grated with a good olive oil, a squeeze of lemon and a few fresh herbs like mint, basil and thyme. The male flowers need to be dipped into a very light batter and deep fried and served with sea salt and lemon. My mother can still can make an overgrown obese adult courgette taste great collapsing with its stuffing of rice and dried fruit and baked until almost caramelised but I prefer them deep fried as a scapece or sliced thinly and grilled on the garden plancha. Roast the hazlenuts slowly in a moderate oven for 10 minutes or until just browned. Cool them down and chop roughly. Place a ridged griddle pan (or use a plancha) on a high heat and leave it there until almost red hot. Top and tail the courgettes and cut them into thin slices - 5mm - on a mandoline or with a sharp knife. Place them in a bowl and toss with 3 tbsp of olive oil and the salt and pepper. Grill on the pan for 2 minutes on either side. You want the char marks without the courgette cooked through. Transfer to a salad bowl and sprinkly over the balsamic vinegar. Toss together and set aside. Once the courgettes have cooled down, add the remaining olive oil, basil and hazlenuts. Adjust the seasoning. Add the parmesan a dribble over a little hazelnut oil and serve. Put the flour in a mixing bowl with a good pinch of salt. Pour in the white wine and whisk until thick and smooth. The consistency should be like double cream and when you stick your finger in it, it should coat it well. Prepare a large plate with a double layer of kitchen paper and heat the oil to 180° in a deep saucepan. Dip the flowers one by one in the batter, making sure they are completely coated and let any excess drip off. When the oil is at the right temperature, release the flowers into the pan and fry until golden and crisp all over. Drain on the kitchen paper and sprinkle with a good pinch of salt. Serve with a wedge of lemon and a fine glass of white wine. I tasted it in Italy and I can not still forget these unique sensations. Your blog is the same ... flavors of life that inspire every sense.